April – Winter is over and a new season begins. Lake and Brown Trout are on a heavy feed and fishing in nearshore and offshore waters for them is usually excellent, world class caliber. The trout fight very hard in the frigid, early spring water and sizes average 6-18lbs with some even larger fish possible. 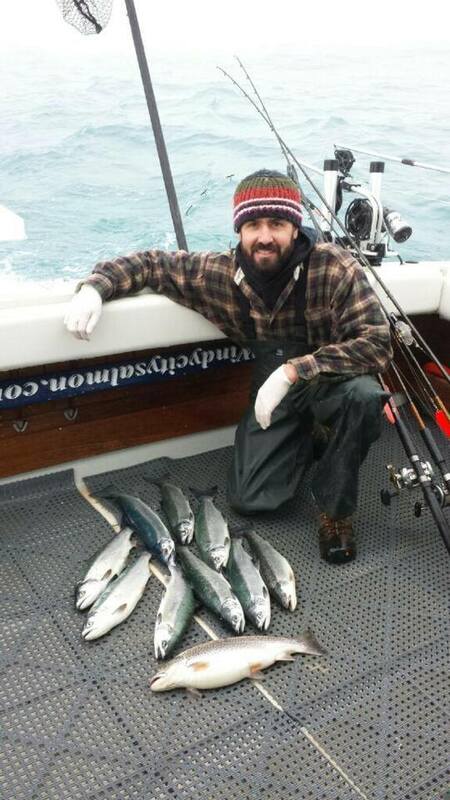 Some Coho Salmon are caught in April too. May and into June – The Coho Salmon Run! 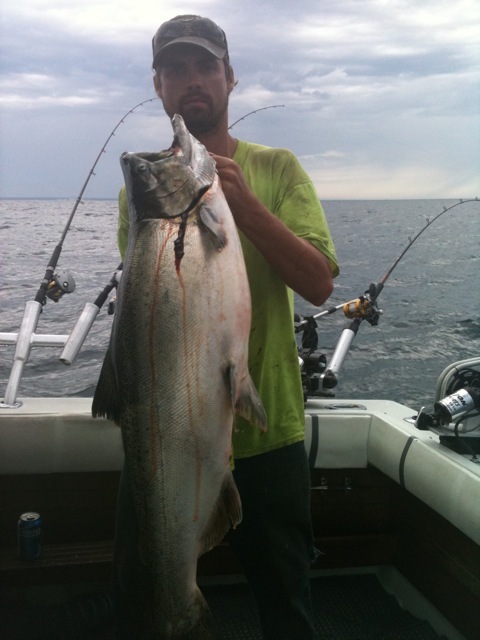 Limit catches of 20-30, 3-6lb Coho Salmon are common. Very fast action and the best time for an all-salmon catch. We can often orient some of our gear towards large Chinook (King) Salmon and other species as well when fishing overlapping habitats/waters. While all the species taste great, many people prefer the taste of Coho Salmon over the other species. Later June and into August – Variety time and best chances for large, King Salmon – Multiple species are usually caught and the best time to catch large Chinook (king) Salmon in the 12-25lb range. Acrobatic, hard-fighting Steelhead usually can be caught during this time, sometimes in high numbers. Coho Salmon getting larger and good numbers can still be caught. Lake Trout catches can remain very good when we target them. Best overall chance to catch all five salmon & trout species in a single trip. Mid-August to end of October – Summer winding down and Fall arrives – The most beautiful time of season to be on the water. World class fishing for large Lake Trout returns again on offshore and nearshore rock-reef structures. Windycitysalmon kicks off the season on Lake Michigan in April as massive schools of Coho Salmon assemble in the southern basin of the lake. While these salmon aren’t the kind of monsters that we tangle with later in the season, the numbers that you can expect to hook into and catch, sometimes in just few hours, can be truly amazing. We will often have 2-3-4 fish on at the same time and our record was 10 fish on at once! May Coho typically run about 3-6 lbs (18″-24″) with limit catches of 20-30 fish not at all uncommon. Gorging themselves on baitfish, Coho are putting on weight quickly after a long winter and usually approach weights of 7-8lbs+ by late-June. Each spring is different though. 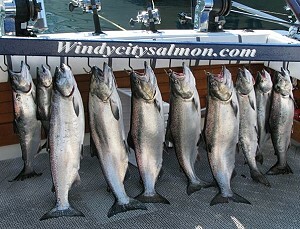 Some seasons there are big schools of Coho off Waukegan in early April and other seasons the Coho arrive in early May. For those seasons where we don’t yet have large numbers of Coho in April, Captain Rick will target Lake and Brown Trout. This is probably Capt Rick’s favorite time of year; after a long winter of no fishing for all of the charter industry, every year it is exciting to see what is swimming in our nearby waters. Most April trips see limit hauls of heavy Lake and Brown Trout when coho have not yet arrived. 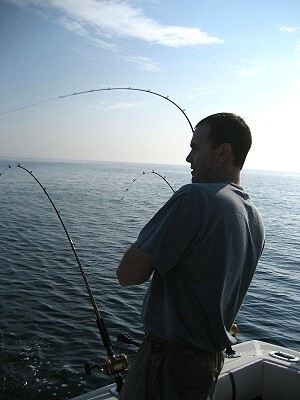 The April-trout fishing is world class and the trout are big, hard fighting, aggressive fish in frigid, April water. If you like to use your smoker at home or have a neighbor who does so, both trout species are excellent candidates for smoking. Moving into later June, the lake usually begins to stratify with cold water – which salmon and trout primarily inhabit – descending deeper and fish tend to be less concentrated. This time of year can continue to yield growing Coho in the 4-8lb class as well as good Lake Trout and Steelhead numbers in the 5-16lb range. Chinook Salmon are starting to be caught in increasing numbers as well. This is the time of year when you can expect to catch a large variety of bigger fish and the weather is often very nice too. Early July and into August is summer season which is defined by multiple species catches and the best chance to catch large Chinook (king) Salmon in the 12-25lb range. These are early morning, 5am charters when the fish are the most active. While multiple species can be caught in the same charter in the summer, sometimes we will need to choose which waters and species we will fish, before we leave the dock, to best capitalize on current conditions. This is an exciting time to be on the lake fishing for trophy, line screaming Chinook! For most people, these fish – along with our Lake, Brown, and Rainbow Trout – will be the largest and hardest fighting fish our customers have ever caught in their lives. Fall season – Mid-August to October – offers outstanding fishing opportunities for large Lake Trout on Waukegan’s offshore and nearshore reefs as well as possible Brown Trout in shallow water. Catches of Steelhead and non-spawning Chinook Salmon are possible at times too. The Lake Trout fishing into late-October can be hard to match anywhere in the world, offering anglers the chance to tangle with some monsters in the 15-30lb+ trophy class. As you can see, there are many different times of the season to consider salmon & trout fishing during the spring, summer, and fall. And when we don’t encounter a hot bite, fishing is still usually good, offering an exciting “mixed bag” of fish to be caught. 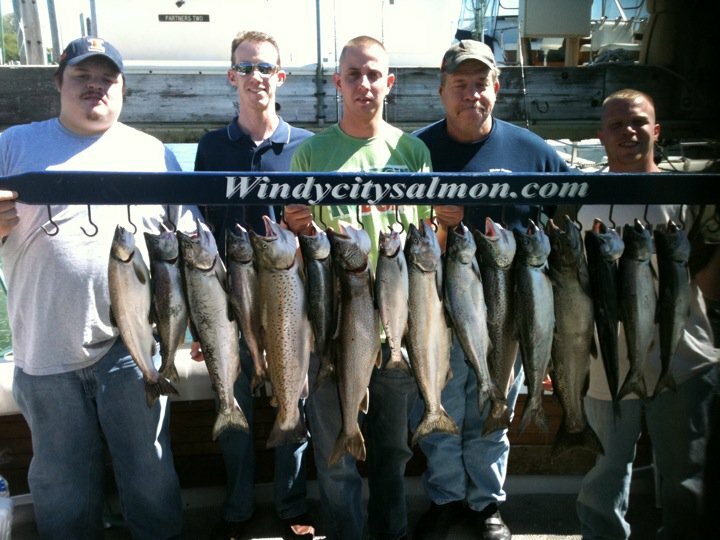 Many seasoned Windycitysalmon customers come fishing several times each season to target specific species at their best times.